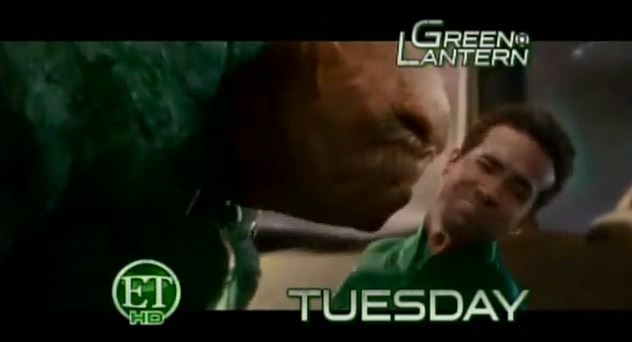 The first footage of the Green Lantern movie starting Ryan Reynolds has hit the internet thanks to Entertainment Tonight. The clip shows Ryan Reynolds transforming into the Green Lantern and confirms that the concept art we saw of Kilowog was real too. The film is going to use more CGI than most other Super hero movies and going off the footage it’s been put to good use. The movie is set for a June 17th 2011 release date and has already got strong rumours behind a sequel which has put grave development issues behind the Deadpool movie production. So far this is the closest thing we have to a Green Lantern trailer but it wont be more than a few weeks off.